Back when I worked as a nurse, I never would have imagined I could earn six figures a year. With the measly 2 – 3 percent pay raise I got each year, I would be lucky if I were making $60,000 a year. To increase my income, I knew that I would either have to return to school and get an advanced degree or switch companies, and even then, I still probably wouldn't be earning six figures annually. If you're interested in a high paying work-at-home career, I highly suggest looking at starting your own business. When you start your own business, you can create multiple income streams, so you're never reliant on a single source of income for your financial well-being. You're creating an asset which can later be sold for a profit. You can automate your business, which allows you to automate your income, and gives you more free time with your family. And there is no limit on how much you can earn as a business owner! 1. Blogger – Do You Like Writing and Social Media? 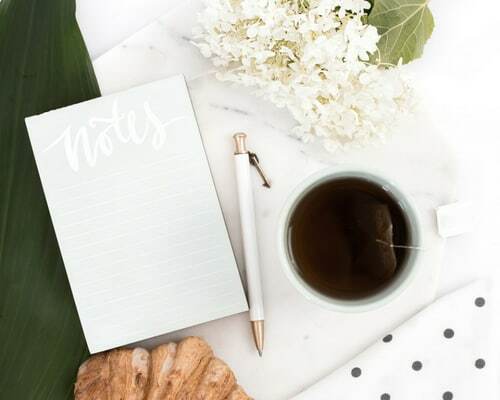 Creating your own blog is an easy and fun way to share your experiences, thoughts, and ideas with the world while also making money from home. Best of all, starting a blog doesn’t cost much, and the payoffs can be big. With the opportunity to write about absolutely anything you want means you'll be working on topics you're passionate about! As a blogger, you will spend time researching, writing, editing, and taking photos for different blog posts. Creating top quality content for a niche audience is key to attracting the most people to your site. You may encounter technical hurdles you’ve never encountered before. Don't worry; this is all part of running a website. Take the time to educate yourself on plugins, analytics, SEO and the tech side of having a blog, so you gain a better understanding of potential issues. Blogging takes time and patience if you want to see results. Bloggers tend to be masters of income diversification. In fact, if you ask two different bloggers how they monetize their sites, their responses will be as diverse as their niches. With direct ad sales, sponsored blog posts, physical and digital product sales, to working with ad networks, and selling services, the ways you can monetize your blog are endless. Ruth Soukup, the brains behind the blogs, Living Well Spending Less, and Elite Blog Academy, currently leads a team of ten employees and earns seven figures a year! Yes, you heard me correctly, seven-figures! While Ruth makes some of her money through advertising and affiliate marketing, the majority of her blogging income comes from physical and digit product sales. 2. Bookkeeper – Are You a Number's Person? If you're detail oriented, analytical, and enjoy working with numbers and data, becoming an at-home bookkeeper may be your ticket to a high-income career. With more and more people starting online businesses, the demand for virtual bookkeepers to keep tabs on income and expenses continues to grow. If you don't have prior bookkeeping experience or knowledge, taking a simple online course, like the Bookkeeper Business Launch can get you up to speed. While keeping track of businesses monthly income and expenditures will be your main source of income, you can diversify your income streams by creating add-ons, like, on-call support for clients, paying estimated quarterly taxes, filing tax forms, managing payroll, creating specialized reports, and one-on-one consultations. Callie Sitek started her work-at-home journey off as a virtual assistant but then decided to make the switch to bookkeeping. To give her the skills she needed for this transition, she enrolled in a virtual bookkeeping course. Today, Callie runs a successful six-figure bookkeeping business where she has a couple of team members assisting her with her clients. 3. Direct Sales Consultant – Are You a Social Butterfly? Direct selling is a popular way to start a lucrative business from home. Typically, direct sales companies charge a small startup fee for a starter kit which helps you launch your own mini retail business. As a direct sales consultant, you won’t work in a brick and mortar location, but instead, you will host online social events, in-home shopping parties, and you'll have a website to sell your products. With so many direct sales opportunities out there, it’s really easy to find one that best aligns with your passions and interests. Direct sales consultants earn a base commission on product sales, but, they can also diversify their income with team building activities. With many direct sales opportunities, the more inventory you sell, the higher your commission rate is. Tysh Mefferd owned a business in the wedding industry when Hurricane Ike hit the Gulf Coast causing the Houston economy to tank. To make ends meets, Tysh started selling Stella & Dot jewelry from home. What started off as a side hustle, quickly turned into a high paying work-at-home career that allowed both her and her husband to leave their prior careers behind. You can find out more about Tysh and the Stella & Dot opportunity here. 4. Flea Market Flipper – Can You Find Hidden Gems? A flea market flipper finds items for free or cheap then repurposes them to sell and make a profit. This job is ideal if you know specific collectibles, fashion, or antiques. It’s also a good fit if you’re a handy person who has an eye for design and a passion for DIY. If you believe one woman’s trash is another’s treasure, then this might be the perfect business for you! Flea market flipping is an interesting business for sure. If you want to generate additional revenue, you can consider starting a blog devoted to finding and fixing vintage items—it’s another great way to earn money. Earnings from selling the reinvented items can vary, but the market can be very lucrative. Melissa Stephenson married into the flea market flipping business years ago. Today, she and her husband Rob, flip items full-time, but they also have a flea market flipping blog, and they teach others how to start their own flipping businesses. By diversifying their income streams, they were able to pull in $130K last year — not bad! 5. Resume Writer – Want To Help Someone Land Their Dream Job? Do you enjoy writing? Do you understand the logistics of the hiring cycle? Then perhaps starting a home-based resume writing business may be your calling. While there’s no degree required to work as a resume writer, a human resource, English, or a communications degree is definitely helpful. You can also take an online resume writing course so that you're well versed in this area of writing. The bread and butter of a resume writer's income will come from writing resumes, but as you become more familiar with the field, you may start offering other services like cover letter writing, coaching, career planning, career transition, and career management consultations. Day Merrill started her journey off as an English teacher, but quickly become fascinated by how MBA students choose their selected career paths. Through a series of career transitions herself, she ended up launching her resume writing and career coaching business. Today, Day has clients from all over the world, and she earns a lucrative six figures annually. 6. Copywriter – Do You Have a Way with Words? Copywriters are the creative people who write the words in TV commercials, radio ads, magazines, newspapers, billboards, brochures, websites, white papers, landing pages, and more! Copywriters have a way with words and are excellent at using persuasive language to motivate potential buyers. While copywriters are best known for working at advertising agencies, there are many freelance copywriters who are making BIG bucks from home! The more sales and leads you can generate as a copywriter, the more money you’re going to make. In fact, excellent copywriters can negotiate a base pay rate with royalties (which is a percentage of the total sales your copy generates for your client). Besides client work, copywriters can also earn money through blogging, online course creation, coaching, and speaking. Prerna Malik, the founder of Content Bistro, started off as a freelance writer and blogger who eventually turned her persuasive writing skills into a global copywriting and content marketing agency. Today, she earns six figures a year writing copy and selling online marketing courses. 7. Virtual Assistant – Are You a Great Multitasker? As a virtual assistant, you will offer administrative support to businesses, companies, and entrepreneurs. The tasks you'll complete will depend on your background experience, education, and skills. VAs can answer emails, make phone calls, schedule appointments, and conduct research, but to make a six-figure paycheck you'll need to conduct higher-level tasks, such as bookkeeping, graphic design, copywriting, marketing, project management, technical support, and so on. As a VA you should have excellent organizational, time management, and communication skills. Virtual assistants can charge by the hour, package, or via a monthly retainer. Many VAs start off by completing client tasks themselves, and over time their businesses evolve into full-service VA agencies. Some get involved with teaching other aspiring virtual assistants through online courses, blogging, coaching, or membership sites. Tawnya Sutherland started her virtual assistant business back in 1999, and after years of working by herself, she decided to create the VA membership site, VA Networking. Today, Tawnya helps other aspiring VAs break into the field via her membership site, online training, and industry events. Oh, and she earns a lucrative six figures a year! 8. Affiliate Marketer – Do You Want to Earn Money By Referring Products and Services? Most people think of bloggers when they hear the word affiliate marketing, but anyone can promote products via an affiliate relationship. Simply apply to become an affiliate, and then share information about the product or service on your blog, website, social media channels, Amazon Influencer Storefront, newsletter, or other third-party platforms. You're compensated when there’s a sale or action taken by the customer. It’s important to note the FTC (Federal Trade Commission) requires affiliate marketers to identify when an affiliate link is used. The ways in which you can promote affiliate campaigns are endless. From traditional banner ads and writing reviews on your blog to using email marketing, YouTube, Pinterest, and more. Just be sure to read each platforms terms before posting affiliate links. Michelle Schroeder-Gardner, the blogger behind the popular blog, Making Sense of Cents has found great success with affiliate marketing. So much so, that she earns an average of $50K a month just through affiliate promotions! If you'd like to learn more about how Michelle does it, you can check out her online course, Making Sense of Affiliate Marketing. 9. Freelance Writer – Do You Love to Write? Do you enjoy writing? Are you able to meet deadlines? Then perhaps being a freelance writer is your path to a high paying work-at-home career. As a freelance writer, your job will involve pitching, researching, writing, and editing various blog posts, online articles, newsletters, scripts, and more, for a wide variety of clients. The possibilities for freelance writers are endless, but your passion for writing is a must. Freelance writers make the bulk of their money from client work, but there are many different ways to charge for your services. You can also diversify your income streams by writing and selling e-books and online courses, maintaining a blog, and writing for different mediums. Gina Horkey was working full-time as a financial advisor when she started moonlighting as a freelance writer. Within a year, she was able to ditch her day job and start working from home full-time. Today Gina earns a generous six-figure salary, and she helps other aspiring writers launch their own successful freelance writing businesses. To find out more, check out Gina's course, 30 Days or Less to Freelance Writing Success. 10. Business Coach – Do You Enjoy Helping People? Do you enjoy helping people set and achieve big goals? Are you an empathetic listener? Then starting a coaching business may be your calling. Coaches are usually trained and certified within a specific area of expertise, such as life coaching, relationship coaching, health and wellness coaching, business coaching, and so on. Some coaches base their niche on their life and career experience, while others may have a background in psychology, business, or a field related to their clients’ area of focus. As a coach, you can charge by the session, hour, or package. Some professional business coaches may even charge a “success fee,” where each time your client reaches a goal or milestone you earn more money. Many coaches go on to write books, create courses, speak at events, and train groups of people. Sarah Dew Finks had worked as a Nurse Practitioner, but after having three kids, she decided to become a full-time stay-at-home mom. But a few years in, she got the itch to do something for herself, so she started a blog. From there she decided to launch a life coaching business. With the help of a mentor, she ended up bringing in six figures in her first year. 11. Course Creator – Do You Want to Help People Learn? Using your expertise and experience in a certain field to create an online course can be a very lucrative endeavor. As a course creator, you must understand who your target audience is and more importantly, verify the demand for the subject matter you are putting out there. You will also need to choose how to deliver your course material (written, video, live webinar, or teleseminar) and which platform to use. Successful course creators earn money when people purchase their online class or tutorial. Some course creators use a tiered system which includes different levels for different prices. Many times, course creators use affiliates to promote their courses, as well as having their own money-making blog. Full-time blogger, Kristin Larsen co-created the course, Become a Pinterest VA Today, as a way to educate others on how to start their own Pinterest virtual assistant business from home. Having achieved much success in these two areas, it was a no-brainer for Kristin to diversify her income by selling online courses. Today, Kristin earns a hefty five figures a month working from home! There are a lot of great high paying work-at-home careers out there—as long as you know where to look. 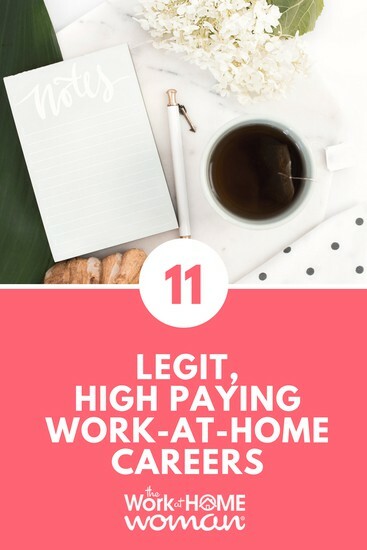 Use this list of lucrative work-from-home opportunities to take your first steps toward making a great living working from home! Certainly, these job options are like a boon for all the work from home seeker. If someone has not tried hands-on transcriptions they should go for it. Transcription services give a great opportunity to excel in career. Especially companies like GMR Transcription are reliable and worthy to count in for work from home options. Yes, transcription can be a great career for individuals wanting to work from home. However, I don’t believe you can make six-figures from doing transcription alone. Holly, I am working from home now as a Crafter. I do not have a car to get around. I started a YouTube channel. But had to stop because the picture quality was bad. So, right now I am stock. If you have any ideas that can get me back on my channel would be great. You are just full of ideas. Please help! Thank you. What were you using as a camera? Many of today’s smartphones have incredible cameras and can be used for recording YouTube Videos. Once you get some money rolling in, you can upgrade to a better camera. Great ideas! I think I like the Flea Market flipper the best. There is money to be made in that. The only bad thing is that sometimes you will sit on an item for months without selling it. But overall, it is a good way to make some extra cash. Thanks for the great post! Glad you enjoyed the ideas, Tanis! It sounds like you’ve done some flea market flipping? If yes, do you rent a storage space for the items you flip? Yes, completely agree with your thought. Starting own business and taking control over our lives is the best way forward to earn a high income. And, the the careers options you’ve listed here, if pursued with dedication, would do a world of good to one’s personal finances in the long run.